Hello dear lovelies!! Today, we bring before you the 31 most stunning garden ideas with pots and rocks that will make your jaws drop really low!! Gardens, we know, are the pristine spots each one of us would always like to own in our homes. To make these verdant spots even more enticing and soothing, why not try out some do it yourself or DIY ideas that make use of humble rocks and pots? 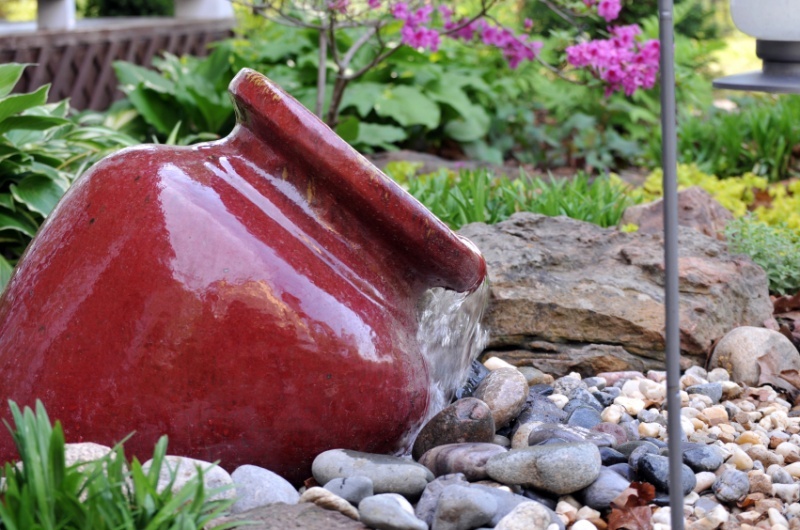 Pots and rocks are an awesome combo that can enhance your garden’s look. There are umpteen brilliant ideas using these elements. Let’s not waste time and get started! Rocks in garden are a latest trend with many people giving their pavements and landscapes a rocky makeover. If you think your garden needs rocky stepping stones, but in a stylish way, then surely try out this butterfly stepping stone idea. The image shows a colorfully laid out butterfly themed stepping stones pathway. The whole design looks very artsy and elaborate and is very easy to do by yourself. You can also design floral patterned stepping stones as shown. Pots garden ideas such as the one showcased above are very artistic in appearance and are a craze these days. We call this idea ‘fairy garden’ and it makes use of broken pots, some decorative pieces like figurines, potting soil and some plants like succulents. The project is easy to do at home and gives deep satisfaction and happiness. 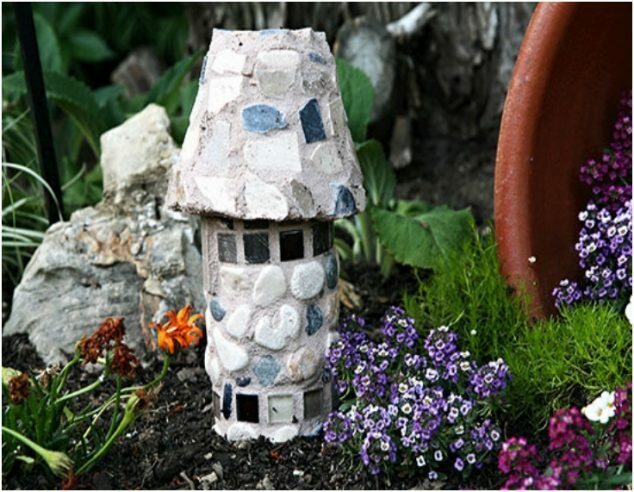 The fairy garden is made out of a broken terracotta pot and beautified with cute accessories as seen. If you have a few pots that are broken, and are keen to use them as garden decor features, go ahead confidently! Its a true fact that pots break, and are often found lying in basements. But, with the above garden idea, you can seriously put these broken pots into use. Some plants can grow in less soil, and propagate well with very little water. You can also plant more than one variety of plants in such a broken pot. The DIY garden project seen above is quite fun to do and can involve your family as well. 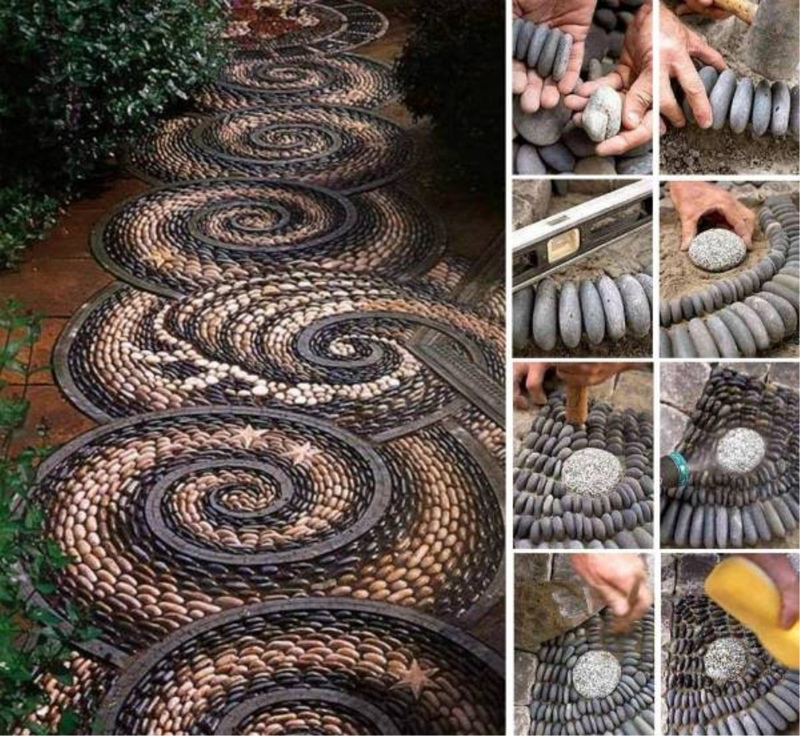 The DIYers have to collect different shaped pebbles or stones, and have some patience if they want to create a unique looking walkway. The shape of the stone pathway looks spiral in design and matches well with nearby surroundings. It is one of the main focal points in this garden. The above image is that of a wonderful garden which has been bedecked with a miniature garden grown in various types of pots. Some of the pots are big, while others are small. We can also get a glimpse of a stone or rocky pot that looks really stylish. One can have a mini garden in these pots. The only thing is to select a spot and match the colors and shapes. Gardens are places where you can unwind and relax. Its a place that must look appealing, and for this purpose, some people place stylish furniture for spending quality time. 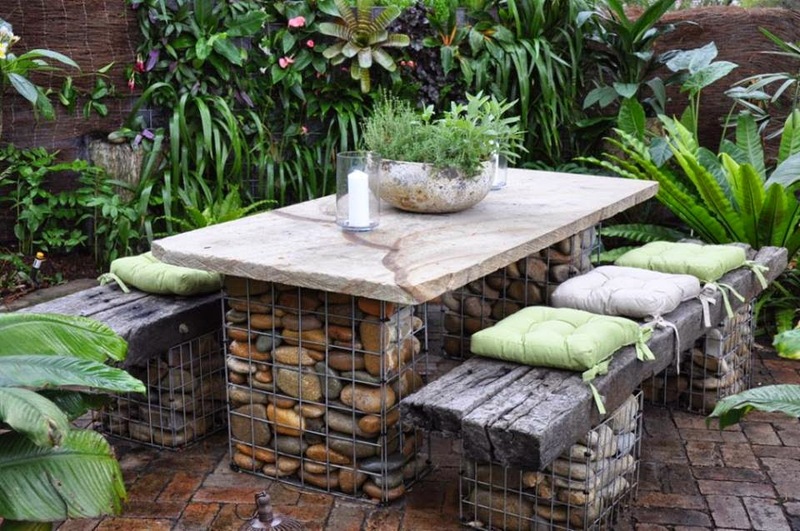 In case you are a DIY person, then use rocks and stones to build your garden table and benches. The stone seating area above looks rustic and quite pleasant. The legs of the table and benches are made out of stones while the tops are made of stone slab and wood. This stone castle is made at home using rocks, pebbles, tiles, PVC pipe and rags. The fairy tale castle looks stunning and is pretty easy to be made. You will need a flower pot also for this castle. You would need to wrap at least two cut sheets of tiles around the pipe and stick on rocks all over. 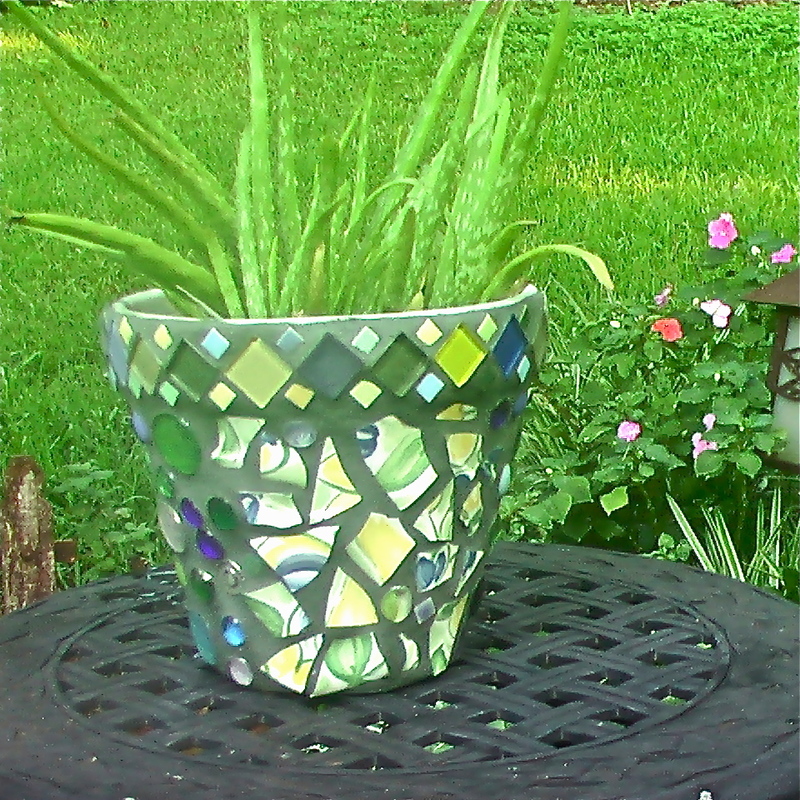 The flower pot too needs to be wrapped with tiles, and then, stones need to be pasted. Once done, push the pipe into the ground and then place the pot in an upside down manner over the pipe. The fairy tale castle is done! Garden ideas with pots and rocks are the new and latest DIY decor fad. 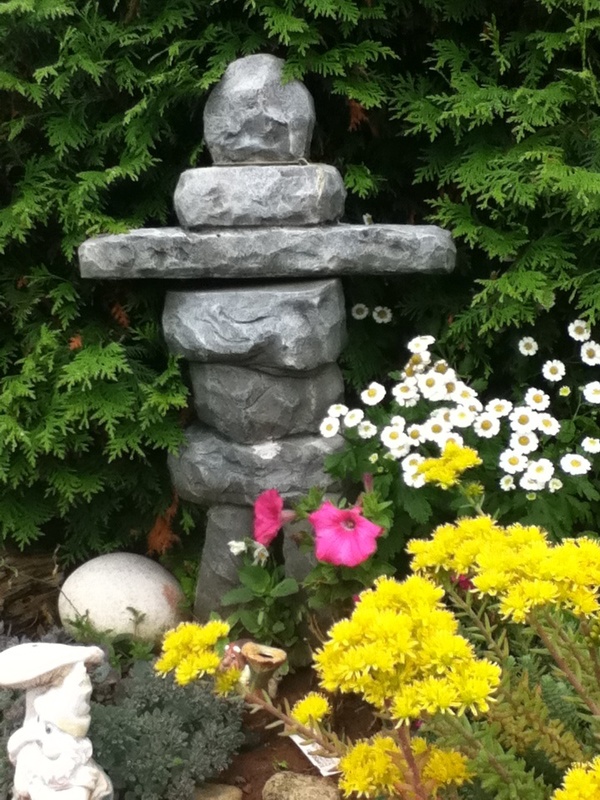 The above example shows how one can use his or her creativity to make astonishing rocky decorations in their garden. The rocky baby footprint decor on a wooden slab looks cute and must be tried. 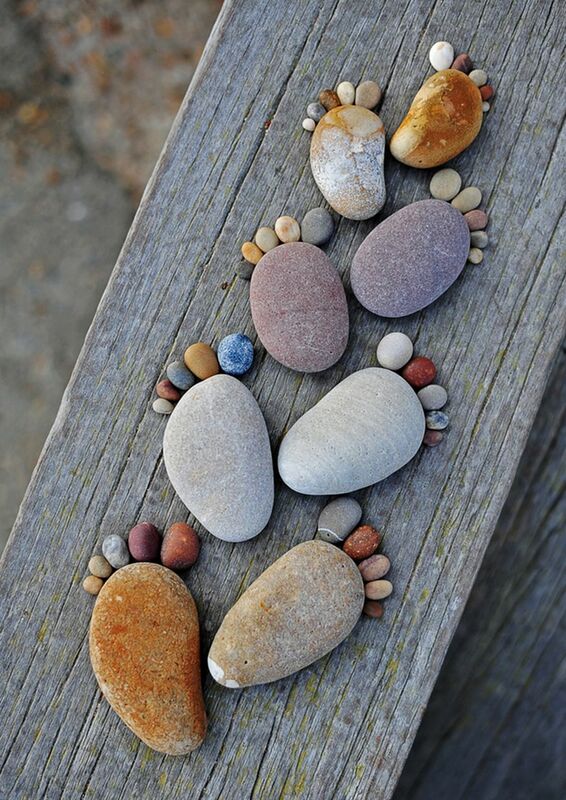 You would need such rocks, stones and pebbles that have roundel edges and can be formed into baby footprints. Choose any color as you like. The above garden decor idea looks very unique and is pretty simple to make. All you need are two clay pots and some paints. 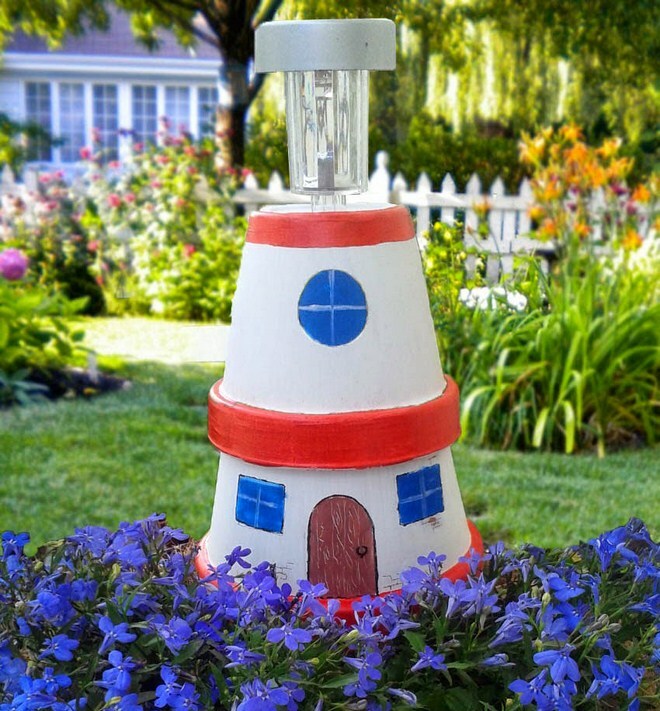 The pots are designed to resemble a lighthouse and are painted with blue, white and red colors. The light fixture is fixed within the clay pots. Its an innovative way to place a garden light that works on solar power. If you are a fan of Minions, then this DIY project is just for you!! 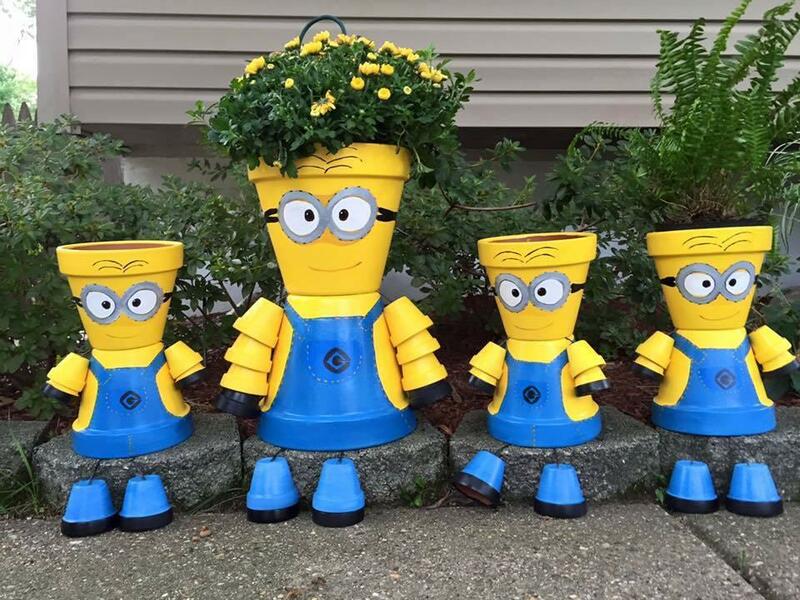 The DIYer has made use of terracotta pots and then painted these to resemble these sweet creatures from the movie ‘Despicable Me’. The bright yellow paint adds a vibrant look to the pots which can be used for planting flowers. Its an easy DIY project and cheap too. Vertical gardening helps such people that have less space. Here, the gardener has placed colorfully painted flower pots on a wooden rack. The pots are bright and add a unique look to the garden area. 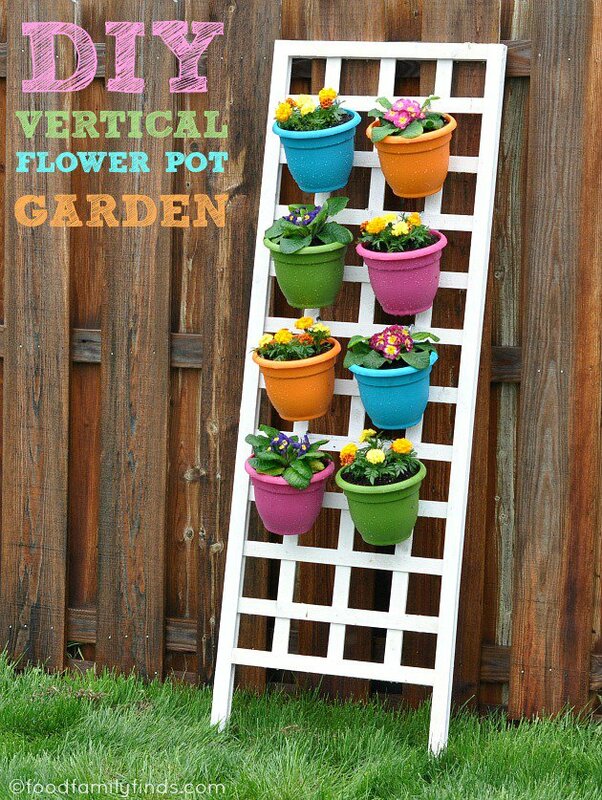 You can use any type of pots for this project. The mini fairy garden showcased above looks very attractive. You all must be thinking that the project is quite difficult, but, in reality, it is simple and anyone can accomplish this DIY project with very less amount of money and time. All you need is a spot where you want the garden, some rocks and stones of varying shapes, some old pots and accessories for decorations. Assemble each and every element as per your liking and according to the concept you have visualized. You can have a layered look for this project. 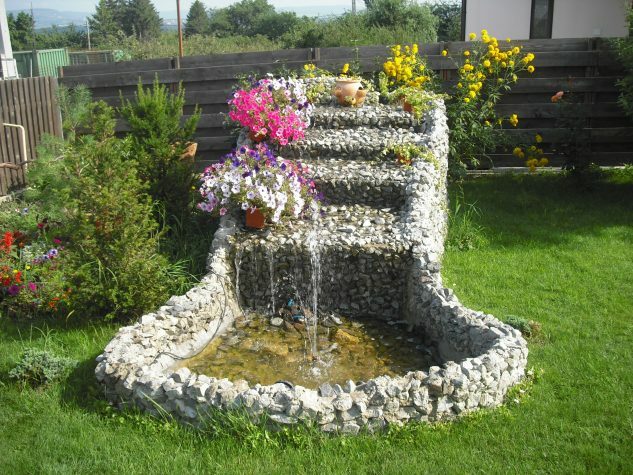 If you want to have rocks in garden, then why not follow this fabulous decor idea shown above? The idea motivates you to use flower pots, rock, stones of different shapes, paints and create an artistic spot in your home. The pots seen in the image are painted with floral patterns and are matched artistically with small and big sized rocks that are painted too. This idea can be adopted and incorporated in front of your entrance where a mini garden can also be created. 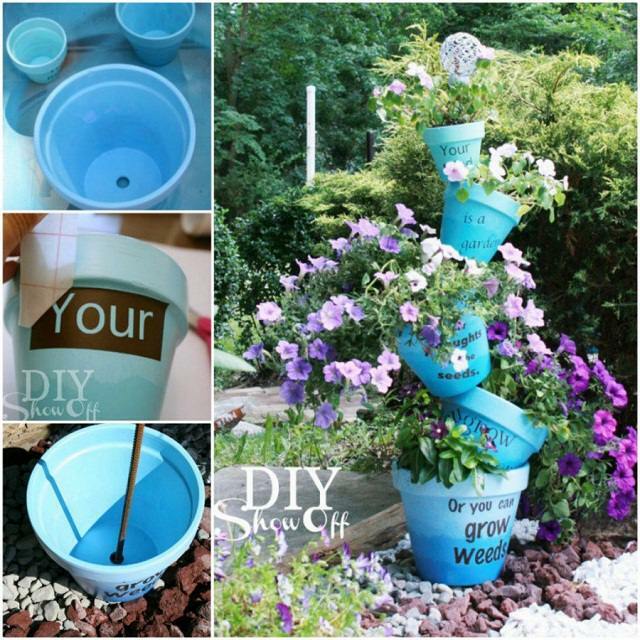 Old and large flower pots can now be used by converting them into beautiful water fountains in gardens. Fountains add an ethereal touch to a garden’s decor and also create a tranquil ambiance for everyone. Most DIY lovers go for pots and rocks when building their own fountains. As seen above, the fountain feature is made out of an old pot. The landscaping done with rocks enhances its look. If you like rocks to beautify your gardens, then here is one cool idea that you can do all by yourself. Rocks can be used to act as planters or pots, such as in the picture showcased above. The swirly rocky formation is easy to make. You can have your own mini herb or veggie garden with the help of this idea. A simple project, it can, however take some time as you get down to add rocky layers to form into this creative DIY rocky pot. Garden ponds add a serene touch to any spot meant for relaxation such as a garden or a backyard. Now a days, DIY lovers are using a lot of stones and rocks to create their garden ponds instead of relying on landscape artists that make use of expensive accessories and elements. 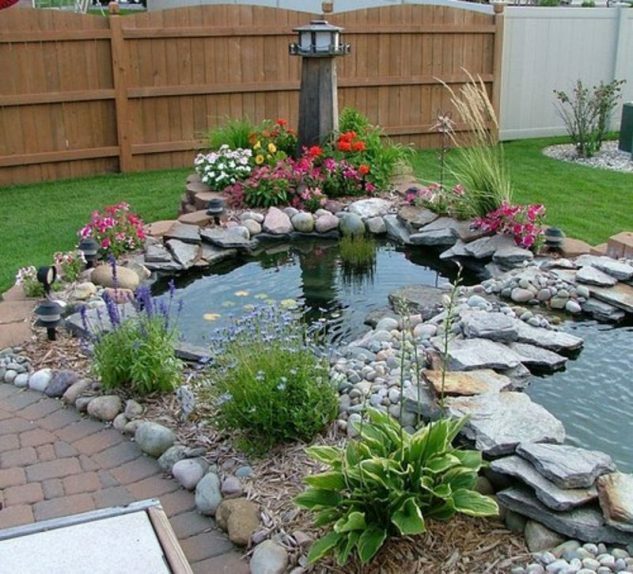 Rocks can play an important part in building ponds such as in the image shown above. The two mini ponds are landscaped with rocks of varying shapes and this lends a natural feel and look to the garden spot. Rocky fountains have a unique charm and lend a very rustic look to any space. The above picture is that of a fountain that has been built entirely of rocks and stones. You can use white rocks for garden features like ponds as this color matches perfectly with other shades like green and pink. The same has been used in the fountain in the image. The layered rocky fountain is easy to build without much expertise. Who doesn’t like cute decorations to beautify his or her garden? Not you..not us!! We all like to create unique features that enhance the look of our homes and gardens. How about creating your very own rocky frog prince? Well…choose some big sized rocks and some smaller ones, paint them, and then assemble to form into an adorable looking frog. 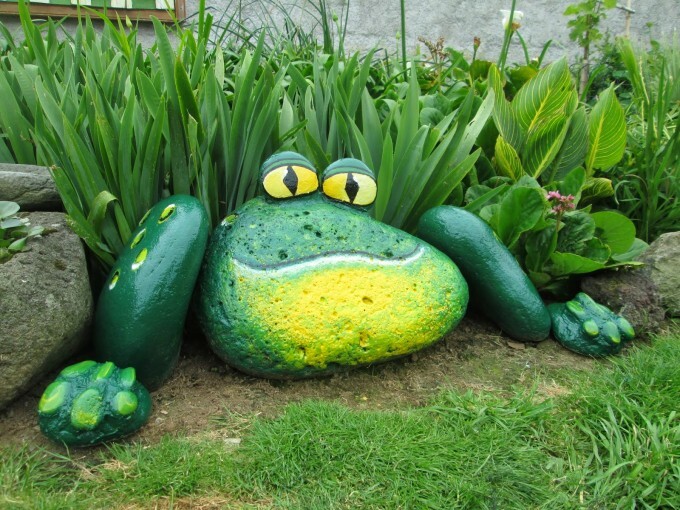 The rocky frog can then be placed anywhere in the garden. This DIY project is perhaps the easiest of the lot as you simply need to stack up rocks on top of each other! The stacked rocky formation looks very stylish and enhances the look of the garden. You can use any type of rocks and stones for this purpose. The end result is fantastic! 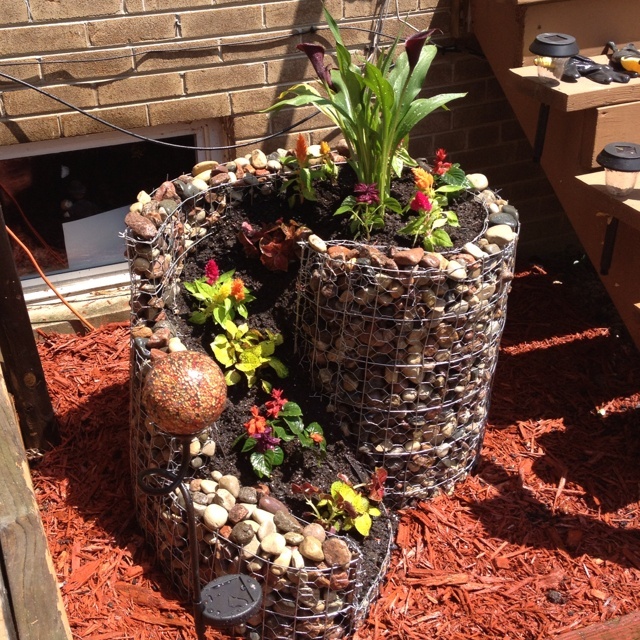 There are many different types of creative garden ideas with pots and rocks, such as the one we have shown above. 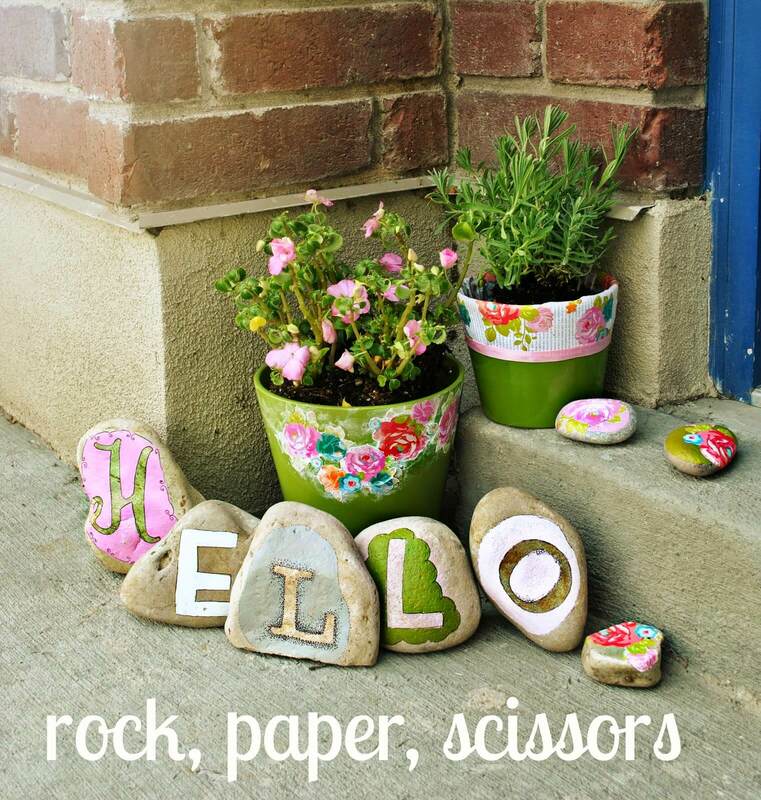 This is a cool DIY project which involves rocks of varying shapes and sizes. You have to craft cactuses using rocks and create your very own rock art for the garden. If you chance upon long and huge rocks, pick them and then color these using shades of green and white to create a cactus look. Now, place all your rocky cactuses inside pots of different styles to stylize your balconies or gardens. You can create garden markers using rocks and stones of different shapes. This is a super easy DIY project even kids can do at home. All you would need are rocks, some paint and you are good to go! A stacked pot decor can add a refreshing look to your garden. The image shows how one can use ordinary clay or terracotta pots, paint these up in pleasing colors and then stack one pot on top of another. This too is a simple project. There are many out of the box pot garden ideas to choose from. If you are thinking of going a little different than others, try terracotta pots to deck up the garden area. The wind chime shown above is made of pots and looks very pleasant in blue with colorful floral cutouts placed inside. These look adorable and are easy to make. The rocks seen above look adorable and very crafty with colorful mosaic decorations. The two hearts and a paw mosaic decor add much charm to this garden. You can place such decorative rocks as garden edging or as border for a rocky fountain. Showcased above is a very attractive and creative project involving large flower pots. 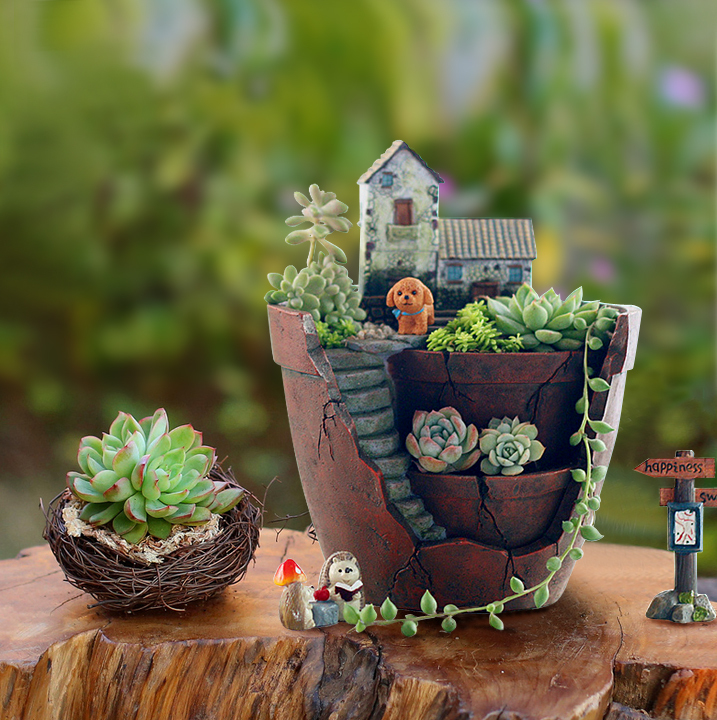 The pot is broken and then used to plant succulents together with adorable accessories like dog figurine and house. The idea is cute and creates a layered look. The layers can be added by placing other small broken pots inside the main large pot. If you love a particular style of mosaic art called Pique Assiette, then this project is one for you! It involves using broken pieces of ceramics and then pasting these on the body of the pots. For this above project, the DIYer has used broken ceramics and tiles for decorations. Its an artistic decoration for your garden. There are many ways to give an aged look to your pots. You can use the chipped charm effect or speckled effect or tough texture effect to add age to your terracotta pots. All you need are damp cloth, sandpaper, foam brush, a cup of water, paints, and primer for creating this look. On a green lawn, you can add a striking design by placing spilled flower pots. If you have broken pots or barrels, lay these down and then plant flowers of various colors like impatiens and pansies. These type of pots also offer a cover or shade for plants. Its a simple rocky design that’s built around the drain. Instead of just leaving the drain uncovered and visible, the gardener has created a mosaic of rocks to form into a lovely sun-ray decor around it. 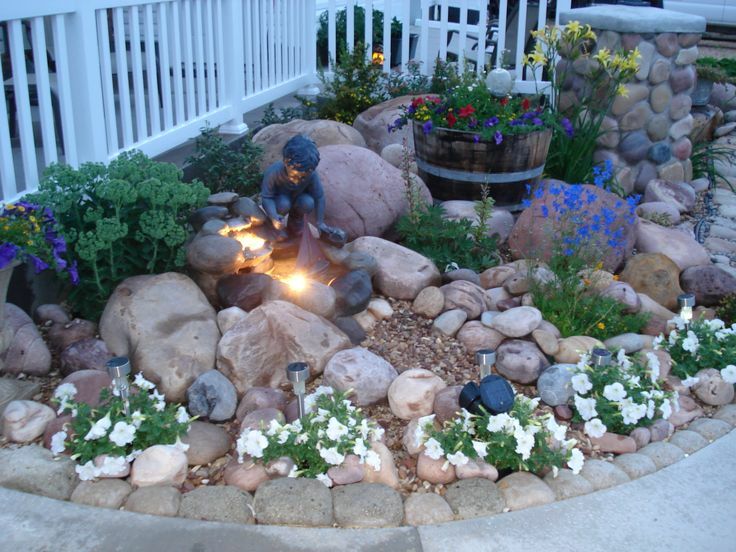 For those looking for creative small rock garden ideas, the garden idea shown here will definitely come to help. The corner of the house has been decked up with this beautiful rock garden featuring rocks and stones of different shapes, a statue of a boy, plants, garden focus lights and barrel planter. The whole spot looks verdant and very appealing. The rock succulent planters in this garden look quite impressive and unique. The rocky garden bed looks alluring too. 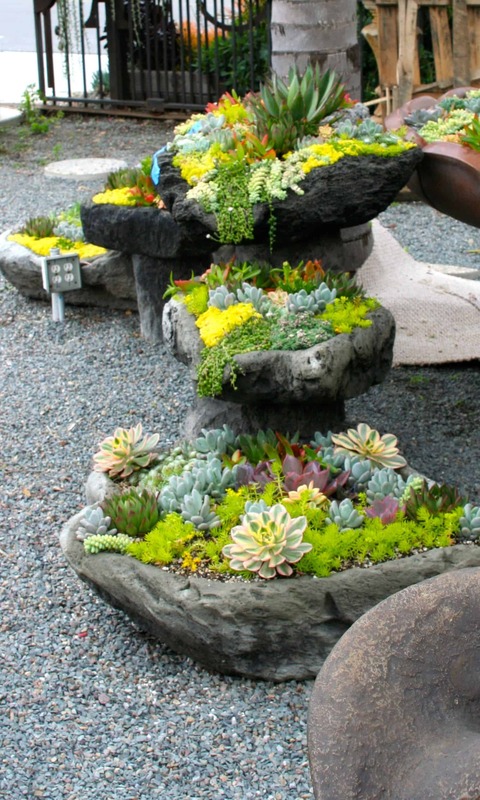 You can plant succulents of varying types in huge rocks as shown above. The design suits such gardens that are inspired by Zen style of landscaping. There are umpteen budget friendly and creative garden decor ideas that one can try. You don’t need loads of money to create your very own verdant nook. With these amazing garden ideas with pots and rocks, you can create a heaven. Do try few of these ideas and see the magic unfold before your eyes!